roaster: Alamance Kaffee Werks; Graham, NC. We looked forward to trying this “AA” coffee from India. Most people have probably never tried an Indian Coffee. India is not well known for coffee, but they have a small but going coffee scene. These beans come from the rain forests of the eastern coast. We’ve also review a rain forest grown Mexican Coffee from Alamance. 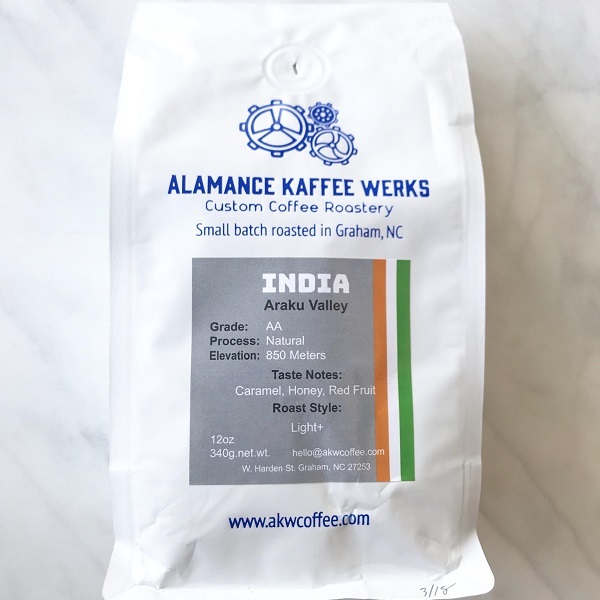 Alamance is small batch custom coffee roaster from central North Carolina. This is a single origin coffee, the “AA” means the beans are slightly larger than a typical arabica coffee bean. AA is a coffee bean that is famous in Kenya, but is also well known in India. This one is a lighter roast that as an espresso had a surprising rich crema, with a nice balance of bitterness and notes of honey. It only had subtle hints of nutty flavor, and it doesn’t deviate far from the flavors profiled as a coffee. As a pour over coffee it’s very rich for a light roast. The full body comes from the earthy rain forest soils and low altitude. Tasting notes of red fruit with a long wine like finish. This is a great coffee, that virtually all coffee drinkers would enjoy, it comes in as one of the top coffees we’ve reviewed and for only $13 it’s a steal. Special thanks to Daniel from AKW for the coffee, visit them at akwcoffee.com. For those of you who are new to Ispirare, we help promote the craft coffee industry by sharing coffees from the top coffee roasters. If you know a coffee we should try or if you’re a coffee roaster, you can reach out to us at ispirarecoffee@gmail.com. Thank You.